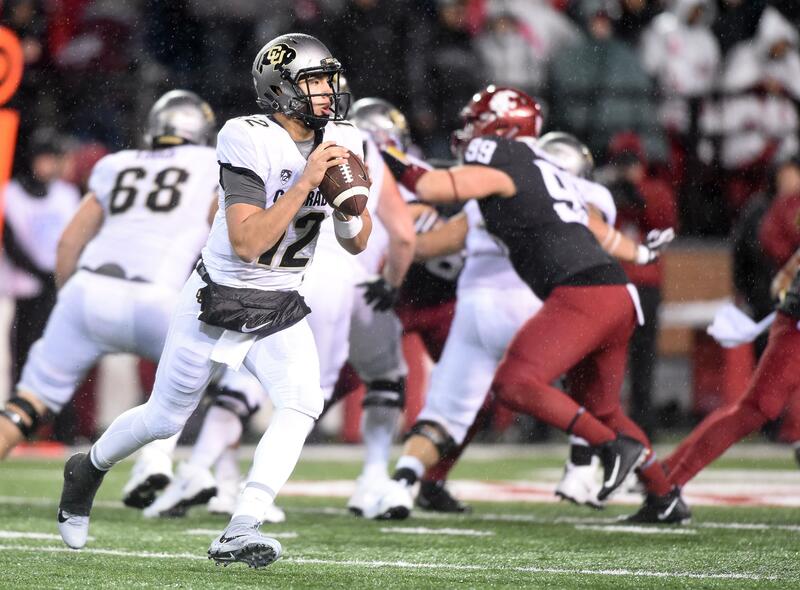 UPDATED: Sat., Oct. 21, 2017, 10:41 p.m.
It’s hard to say what affected Colorado QB Steven Montez more – the miserable conditions at Martin Stadium or the eager WSU defense. Either way, the senior had a forgettable night. Montez, who entered the game 26th in the nation in passing yards, was benched after going just 4 of 13 for 21 yards in the first half. He missed on his first seven passing attempts, and several of them weren’t close to his intended receivers. Redshirt freshman Sam Noyer replaced him after halftime. Montez came into Saturday with 1,691 passing yards and a 63.6 percent completion rate. Published: Oct. 21, 2017, 10:36 p.m. Updated: Oct. 21, 2017, 10:41 p.m.